start decorating those parties as as serving them. which wokring part time with an area florist. florist of course they went for it. Trish uses Vermont flowers in beautiful arrangements to create unique wedding settings at such high profile Vermont wedding venues as Riverside farm, the Amee farm, the Casabella Inn and the Swiss farm Inn located in the wedding hamlet of Pittsfield Vermont. Spring finds the greenhouses over flowing with beautiful flowers. Vegetable plants, allowing Trish to grow many of the flowers she will later cut for parties. The Shop also rely's heavily on local growers and very reliable Vermont wholesalers in case you're looking for those perfect blue Hydrangea. Depending on the time of the year you may find Trish herself of Jeff and their Yellow Lab Bess cutting Hay for their small herd of cattle, tending to their pumpkin patch for fall sales or selling Christmas trees. 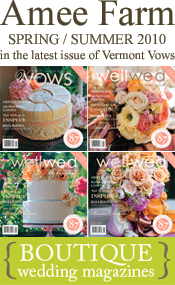 So if you are planning a special event in Vermont please stop by or call. From formal centerpieces to pots of herbs, and sunflowers Trish is their to help your vision become reality!